For the YAckers book group. Cas is a ghost killer. How can that be, you ask, since they’re already dead? Well… some ghosts don’t want to stay dead. And some ghosts start acting out against humans, harming them. And it’s those ghosts that Cas, with his family heritage — his father was a ghost killer before him — and his athame — the knife that does the killing, tackles. That doesn’t mean everything is coming up roses. In fact, quite the contrary. Cas’s father was brutally murdered by a ghost outside of Baton Rouge, Louisiana, and Cas has been spending the last several years working to get good enough to go back and face whatever it is. And so, when he gets word of an especially violent ghost in Thunder Bay, Ontario, he knows he has to go get it. Her. A bit of an aside here: I don’t do horror. Period. Never have, never will. And yet: I found myself attracted to this book. 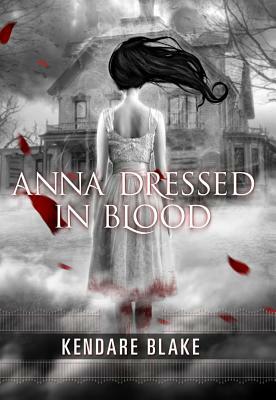 From the ink the color of dried blood, to the violence that Anna does (and she does some violence), to the intense (for me!) climax at the end (they got the ghost with a hundred pages left to go, and I was wondering what Drake was going to do with them; worry not: they’re incredible), I couldn’t put this one down. Another quick aside: the over quote from Cassandra Clare is “Spellbinding and romantic.” Um. NOT. This is not a romantic book. This is a violent, bloody, intense book. Sure, there’s a bit of love-falling-into, but honestly: don’t let the girl in the dress on the cover throw you off. It’s an episode (or three) of Supernatural. It’s a ghost Buffy (the comparison is aptly made in the book, actually). It’s a ramped-up, less funny Ghostbusters. It’s awesome. Perhaps it’s spellbinding. But it’s not romantic. Unless, of course, you find grappling with a deadly ghost romantic. Then, yeah. It’s romantic. Either way, it’s worth the read. I don't always love horror, but I really, really enjoyed this one. I thought it was engrossing, different and scary (but not too, too bad). Glad you enjoyed it, too! OK, after this review and my friend's endorsement (she stayed up until 4:30 a.m. with it! ), I'm officially adding to my TBR list. Which is too long already, but whatever. Well, not romantic as in kissing romance, but it's got a solid sense of right and wrong and good guys going to the rescue, so in that sense it's a romance. Just not in the modern sense. I hadn't thought of it as horror though; it wasn't that grisly and the author didn't linger over the gross bits. Glad you liked this one, Melissa! It's the first YA paranormal I've read in a very long time because they became so formulaic for a while. This one broke through a lot of boundaries for me and was more interesting than most. Loved it! Looking forward to the second book, Girl of Nightmares. You know, Andi, I am too.